Our shelf brackets bring together the classic look of wrought iron and wood to add a little flair to your den, office, family room....wherever you need to add extra storage. 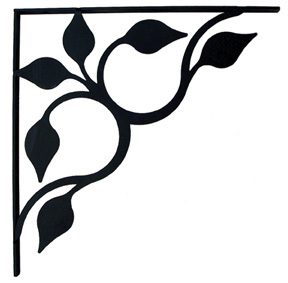 These wrought iron wall mounted shelf brackets are made to support a 1 x 6 Shelf. Sold in Pairs only. Mounting hardware is included. Black baked-on satin matte powder coat finish. Our small (6") shelf brackets can be shipped via USPS Priority Mail at a flat rate of $6.95, unless combined with other items for shipment. Select Flat Rate as your shipping method during checkout to take advantage of this rate. These American made wrought iron shelf brackets are handcrafted in Fabius, New York, by Village Wrought Iron.